Intel is buying deep-learning startup Nervana Systems in a deal that could help it make up for lost ground in the increasingly hot area of artificial intelligence. Founded in 2014, California-based Nervana offers a hosted platform for deep learning that's optimized "from algorithms down to silicon" to solve machine-learning problems, the startup says. Businesses can use its Nervana cloud service to build and deploy applications that make use of deep learning, a branch of AI used for tasks like image recognition and uncovering patterns in large amounts of data. Also of interest to Intel, Nervana is developing a specialty processor, known as an ASIC, that's custom built for deep learning. Financial terms of the deal were not disclosed, but one estimate put the value above $350 million. "We will apply Nervana’s software expertise to further optimize the Intel Math Kernel Library and its integration into industry standard frameworks," Diane Bryant, head of Intel's Data Center Group, said in a blog post. 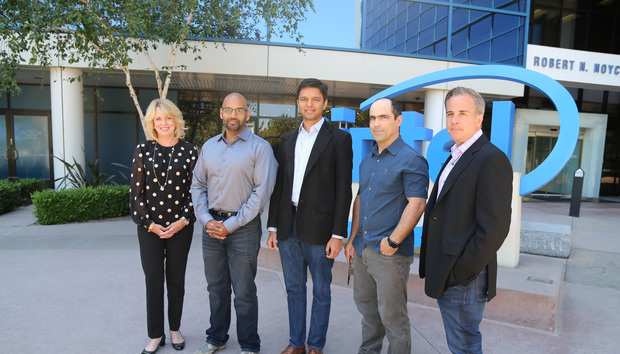 Nervana’s expertise "will advance Intel’s AI portfolio and enhance the deep-learning performance and TCO of our Intel Xeon and Intel Xeon Phi processors." Though Intel also acquired AI firm Saffron late last year, the Nervana acquisition "clearly defines the start of Intel's AI portfolio," said Paul Teich, principal analyst with Tirias Research. "Intel has been chasing high-performance computing very effectively, but their hardware-design teams missed the convolutional neural network transition a few years ago," Teich said. CNNs are what's fueling the current surge in artificial intelligence, deep learning and machine learning. AI startups are some of the hottest acquisition targets recently. Late last week, Apple snagged Seattle-based firm Turi. Intel hasn't extended the instruction set for its mainstream Xeon processors to accelerate CNNs. The latest generation of Xeon Phi -- code-named "Knights Landing" -- focuses on supercomputing but does not include CNN acceleration or a favorable on-chip interconnect architecture, Teich said. "Intel has very public plans to couple field programmable gate array (FPGA) chips next to processor chips in an upcoming Xeon multi-chip package," Teich said. But FPGAs "occupy an awkward performance middle ground" between software running Xeon or Knights Landing cores and specially designed cores such as those designed by Nervana and KnuPath, Teich said. "FPGAs are a bandage to fill the neural-network gap in the short term, but they are not a cure." Now, Intel's Nervana acquisition is "an admission that they didn't acknowledge the potential" for AI technologies like deep learning and machine learning, even as companies like Nvidia were "doubling-down" on them, he said. "Without this acquisition, they won't have a product to fill the gap in their portfolio for at least two years." As part of Intel, Nervana will continue to operate out of its San Diego headquarters, cofounder and CEO Naveen Rao said in a blog post. The startup's 48-person team will join Intel’s Data Center Group after the deal's close, which is expected "very soon," Intel said.